I don’t quarrel with my wife much. I’ve never been much good at arguing. Decades of being on the losing side of marital debates will do that to you. What probably saves my confidence from taking too much of a beating is that we agree on most things. That and I’ve learned to recognize from past experience when I am about to go down in defeat again. One of my first clues is when I start hearing things like: “I’m not arguing with you, James; I’m just explaining to you why I’m right.” To compound her advantages over me, she has three sisters just like her, and she’s not afraid to use them. My better half has always kidded about things like the importance of wealth, income, or financial status. In reality, money doesn’t even make the top 10 on her list of things that make people happy. But she does believe having enough money helps one to live a more independent life. That’s one of the things we agree on. Even so, the “not knowing where to shop” part of her response struck a chord with me. Why? Because it raises questions about the consequences of not having enough options to make good decisions. And that’s why the rest of this article addresses the importance of having enough alternatives to make decisions that fit our own needs, not someone else’s. And even more critical, defining why consumer decisions should be made independent of the seller’s preferences. As a consumer, it concerns me when I hear that another brick-and-mortar store is closing. The reported reasons are always the same. They center around a company’s inability to compete with giant online corporations. I think the thing that bothers us the most is the heartbreak of seeing people losing their jobs. As devastating as that is, we should not forget the additional consequences of buyers being left with fewer viable options. Worthwhile choices can breathe new life into traditional products and services without damaging the growth of e-commerce. Options take aim straight at the needs of the buyer. For example, if I need to purchase something I’m not familiar with, I want the possibility of visiting an outlet where I can look at it, hold it in my hands, and feel the weight and quality of it. It shouldn’t matter if it’s a pair of jeans, a frying pan, or bag of mulch. I want to use my senses to test it before I make the final decision to invest in it. Same thing when I put my business owner hat on. If I want to see a demo of a piece of hardware I’m not familiar with, it should be my decision, not someone else’s. And I don’t want to hear that return policy stuff. Spare me the hassle of taking back something I didn’t want or expect. Who has time for that? On the flipside, if I’m replacing the sweater or frying pan, if I already know what I want, I want the option to go online to Amazon, Costco, or Wanda’s Pretty Good Garden Supplies, key in the SKU and credit card info, and be done with it. The point is that options are important to just about everyone, so long as they fit within our needs. Take them away, and you’re left with someone making decisions for you. And as we all can testify, some or all of them you won’t like. We already have congress to do that for us. Besides, if I make a mistake, I want to own it. To paraphrase the prodigious Scott Adams, author of Dilbert: Informed decision-making comes from a long tradition of guessing what you need and then blaming others for inadequate results. As the relentless progression of technology increases, so does the need for options. Consider that Amazon, a company that has long dominated e-commerce, is building brick-and-mortar stores. Even though they are blamed for the demise of so many of them, they are investing in building bookstores and grocery outlets. Sounds counterintuitive, doesn’t it? But in fact, it was recently announced that they are accelerating the construction of physical stores. Why? Because they know the value of giving consumers and businesses what they want: choices. Now let’s look at things from the other end of the spectrum – the companies that literally built their businesses from the ground up by constructing stores all over the world. The businesses that are supposed to be the most vulnerable right now. Wholesale giants like Costco and Walmart may have started out as huge outlet stores, but they now offer online products and services for just about anything you can think of. And they are all applying the technology and resources that made them so successful in the first place in the form of self-service scanning, artificial intelligence, and robotics. 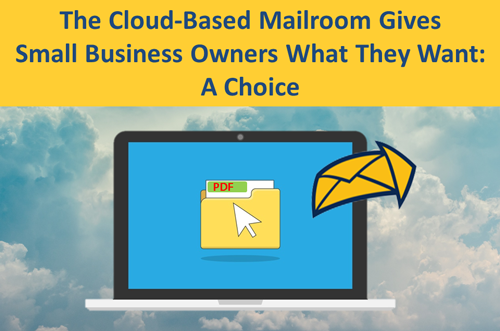 So, let’s get down to why a cloud-based mailroom helps just about any business run better. That’s right, it provides options. Options many business owners don’t even know exist. The Cloud-Based Mailroom is a software product of DocuSend web-based print-to-mail services. It is powered by MTI, a data-based bill rendering company specializing in long-term contractual agreements with businesses that have to mail large volumes of invoices and statements. But let me back up just a little. Mail Technologies Inc (MTI) was founded in 1991 as a bill rendering service company providing processing, printing and mailing services to a range of vertical markets – cable companies, utilities, credit unions, collection agencies, just about any organization that produces a significant number of statements and invoices. We still do it today, but it’s not a good application for small volumes. There are just too many transactional costs involved in mailing small quantities. You have to design and customize the bills and procure custom materials like forms and envelopes; and the client’s data has to be mapped to a legible format and distributed to the recipients. And to make things even more difficult, the entire process has to be maintained and updated every time there is a version change or software upgrade. It’s like using a yacht to cross a stream. That’s the reason it doesn’t work well for a company that mails out a couple of hundred bills a month. That’s why we invented the Cloud-Based Mailroom: It provides the option of working without client data. 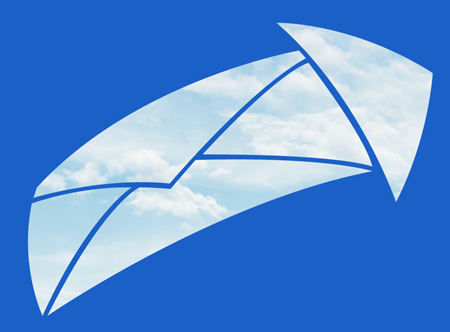 The Cloud-Based Mailroom can work with data – but it doesn’t have to. If you use software, any software, that can generate a PDF, then you can mail it using your own personal mailroom in the cloud. And it takes just minutes. Of course, we’ll help you choose the right option. I remember in the early days of on-demand water heaters, I chose one that offered two options for taking a shower: third-degree burns or skinny-dipping in Antarctica. We’ll make sure that doesn’t happen to you when you use your DocuSend mailroom. Our cloud-based mailroom can print and mail just about any document you can throw at it and is always there waiting for you when you need it. And if you have special mailing requirements, or just have questions, please contact us to find out how we can help you. We’ll give your business its own personal mailroom that will cut your bill distribution costs in half.